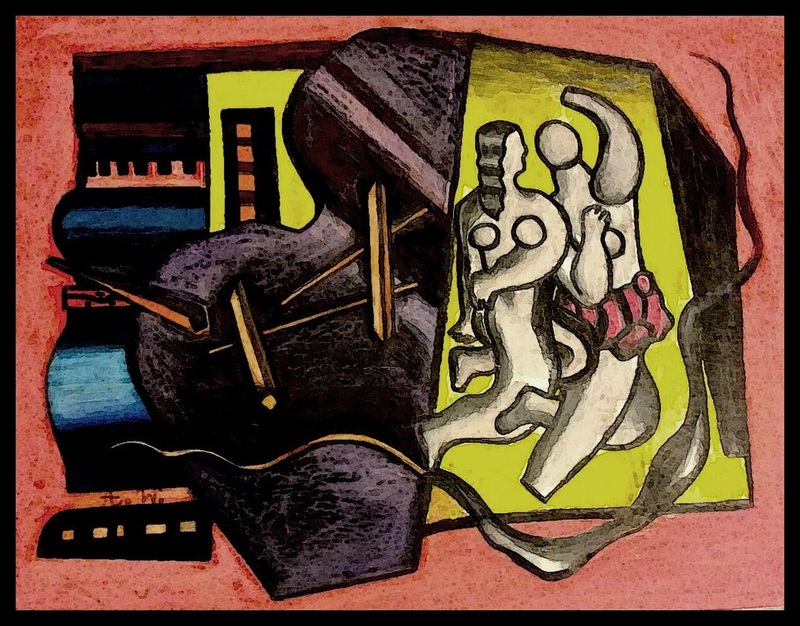 I succumbed to the temptation to write about a mystery artist whom I have been following for some time. I know the artist only by their monogrammed initials and by artworks posted on an on-line auction. The artist's representative advertises the artworks as signed originals without spelling they are replications. The point of this article is that I believe it is more pleasurable to own a hand-painted copy of an original than a worthless lithographic poster. For one there is a show of support for the artists and secondly, the hand painted or drawn artworks have a charm and patina of their own. Of course one can also collect hand-painted forgeries. I own some and admit they also have a charm of their own and are as close to owning an original as can be. Tongue-in- cheek I am even tickled pink to publicize them to my visitors as bona fide forgeries. Let me start with an excerpted definition from Wikepedia: Art forgery is the creating and selling of works of art which are falsely credited to other, usually more famous artists. Art forgery can be extremely lucrative, but modern dating and analysis techniques have made the identification of forged artwork much simpler. Art forgery dates back more than two thousand years. Roman sculptors produced copies of Greek sculptures. Presumably the contemporary buyers knew that they were not genuine. During the classical period art was generally created for historical reference, religious inspiration, or simply aesthetic enjoyment. The identity of the artist was often of little importance to the buyer. There are many companies today that sell hand-painted, sometimes museum-authorized copies. Usually they are painted by advance graduates and post graduates masters of the fine arts students and at other times by professional painters earning money on the side. I have a couple of such art pieces hanging on my walls. 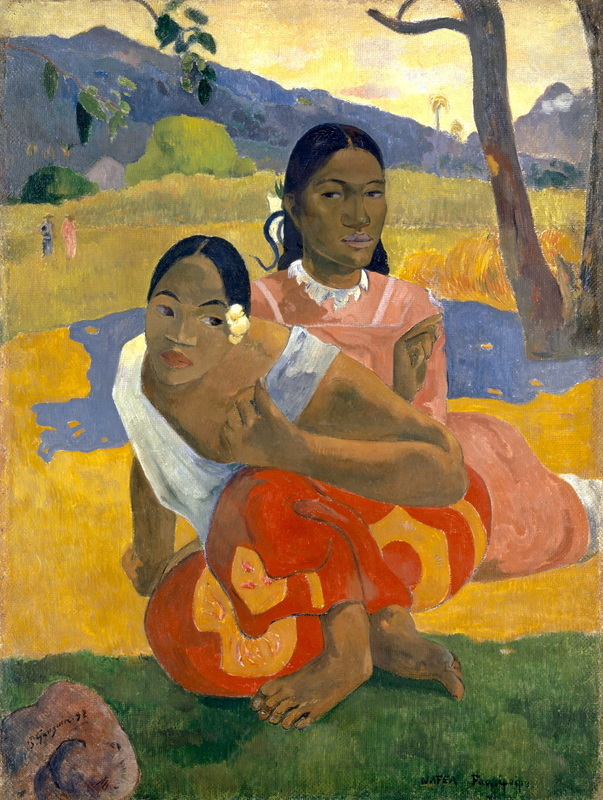 One in particular when, in 1954, my father splurged and bought a stroke-by- stroke, hand painted, museum-authorized copy of Gauguin's Nafea Faa Ipoipo (When Will You Marry? ), 1892, that I have highly enjoyed to no end to this day. This article is about an artist who signs their artworks with the initials A.W. and whose name has been, once upon a time, been proclaimed by his representative to be Andrei Wolski. Of course an authentic name is also at the basis of any curriculum vitae. However, since his artworks are signed only with his initials and I never received further confirmation and my being interested in writing about the artist, I can only go by my sleuthing that consists of analysing the handwritten address on the snail mail packages I receive from Poland. initials I cannot call them forgeries. Had they also copy-imitated the legitimate author's signature would qualify them as forgeries. I also have strong suspicions as to the gender of the artist. The monogram A.W. to boot, may be a pseudonym and drawing on the commonality of the name and other artists by the same name, except for minor spelling variations, could be all part of the anonymity and the willful misdirecting game. For the purpose of this article it is of little importance since it is the apparent quality of the final product that counts. However, I felt tempted, like Dan Brown of the Da Vinci Code fame, to create a story with an appropriate mystery surrounding it. Of course I want to first warn the reading public of the scams perpetrated on their wallets and their art knowledge pride. There's nothing like correct information of not the hearsay kind that is worth the effort if one is interested in art and its provenance. I reiterate that good art, by bona fide artists, can be had for a fraction of ongoing gallery prices. The galleries, who themselves may knowingly or not be selling forged art, have been challenged and exposed on many occasions by having been taken in by master forgers. This can be attested by the USA market having been flooded since the early 1960s with innumerable forged modern art. Usually that art comes in the form of limited editions prints that permit the multiple sales of multiple identical copies to unsuspecting, poorly educated in the arts, customers. 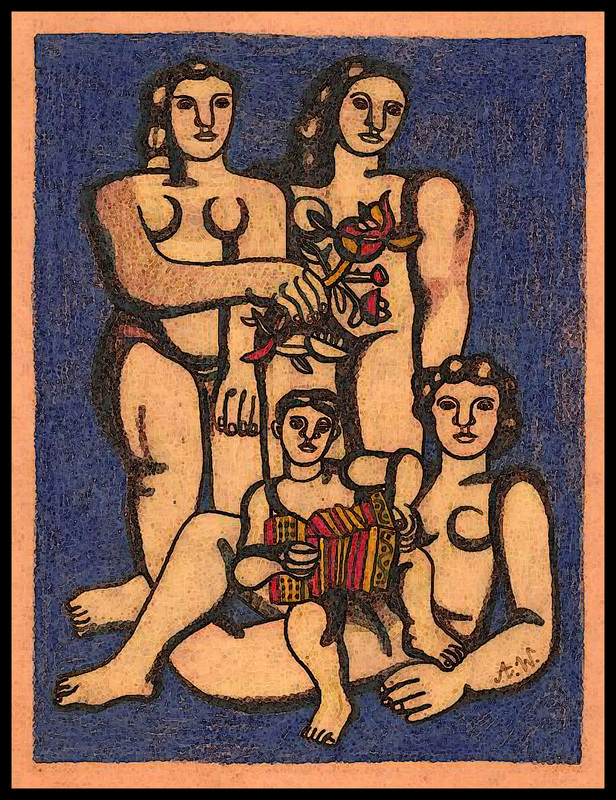 Such graphic prints far exceed the possible production of any artist during their lifetime that the forgers produce. To name a few, Salvador Dali, Miro and some lesser known but historical figures. I won't even mention the multi-million dollar fakes decorating the walls of museums who also have been caught in their own race for status recognition. As for me, after all, there's nothing better hanging on my wall than a $300.000.000.00 original Gauguin artwork of which a hand copy was bought for about $200.00 many years ago. Since that historic purchase, many on-line auction houses and individuals have been selling forgeries, so beware not to get caught buying a famous artist as a "lost treasure". I assure you that in 99.9999% of cases it is a scam. However, praise yourself if you buy it at a less than reasonable price and as a copy. This is not like I want to discourage you from lining your home with worthless stock certificates. Over the few years that I have been buying the above named artworks I requested from the representative on several occasions to furnish any biographical background on the artist but every time she stated that the artist wished to remain anonymous. My curiosity was pricked and I noticed the uncanny resemblance of the handwriting of the representative on the envelopes and compared them to the initials on the artworks. Since both our names contain the letter A, E, K and N I couldn't help notice that the representative's handwriting and the initials on the artworks were uncannily similar. My analysis also included examples of her return address and without much further sleuthing I suspect that the representative and the artist may very well be one and the same person. ​Much of the figurative artwork resembles the figures drawn by Lyubov Popova and Fernand Leger while others draw on the style of Kazimir Malevich while others appear to represent local folfloric genre scenes. The latter are most noticeable in the figurative groups. They appear to depict local folklore and people and dress typical of Fernand Leger and of the peasantry represented by Malevich. I respect the need of the artist for anonymity but that wish makes me suspect because of the imitative styles and copies of subject matter. In many ways it is an unnecessary situation because the artist seems to be gifted and the prices could be higher without this game of anonymity. I even excuse the imitative styles as strictly a learning process and were that the case I'd gladly forgiven the artist. Just sell the artworks for what they are! Otherwise, there's little originality about the artist's subject matter except a pretty good imitative knowledge of stylistic cubism. Such blatant mimicry may simply be the result of art apprenticeship but as we analyze further the artist's craft I see simply a commercial venture. exposure that impinge on one's liberty and privacy it's time to call it quits. In the case of A.W. it is simply curious but suspect at the same time. That artist apparently does not seek a higher demand for their art and appears to be satisfied with a humdrum repetitive output. On several occasions I contacted the representative who also asked to remain anonymous. Such disqualifications did not diminish my interest in A.W. 's artwork. Not being aware of the real identity of the artist I suspect that the representative and the artist including the mix of their genders may be one and the same person. After all, what is of interest is the artwork alone. Personal information is strictly for gossip purpose, and the building up of a mystery surrounding the artist is that it's not like fame will knock any time soon at their door. At one point I was tempted to write a story on how Lyubov Popova, on one of her foreign excursions out of Soviet Russia to Paris, how she met with Fernand Leger and how they sired an illegitimate child who became a master forger of both their artworks but I don't think the reader here would be interested unless they could buy one of the artworks shown hereby. Considering that the copyrights on these artworks have expired and they are not exact copies in technique nor size duplication, they are as near to the originals in execution. For further self-erudition I recommend the following excellent essay about Copies and Forgeries: What Difference Does It Make? by Leo Segedin in 2005 at http://www.leopoldsegedin.com/essay_detail_copies.cfm and especially the story of a clever and sensitive forger's life, Mark Landis, who never sold his copies but donated them. There is a must-see 90 minutes documentary on that artist who fooled more than 60 museums in believing they were receiving philantropic original fine art gifts. See https://en.wikipedia.org/wiki/Mark_Landis. responsibility for this message and approve it. Chuckle, chuckle! Alex Nodopaka is the Art Editor of Vayavya.